FRISCO, Texas (Aug. 30, 2017) — US Youth Soccer is excited to kick off the 15th annual Youth Soccer Month – Celebrating Soccer in America this September, and the celebration continues throughout the month promoting the benefits of soccer. 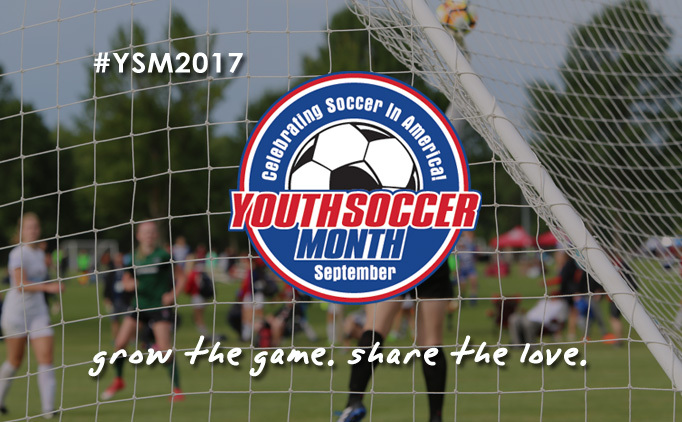 The purpose of Youth Soccer Month 2017 is to raise awareness of the game’s many advantages and encourage others to continue enjoying soccer, bringing kids and families together for a national celebration. Youth Soccer Month includes working with local leadership to organize grassroots public affairs campaigns, numerous local events and media relations initiatives. To kick off the fun, US Youth Soccer has set apart the first Wednesday, Sept. 6, to hold the sixth annual Street Soccer Day. To participate is simple. Organize a time and place for players to come together and play pick-up games. After a successful first year in 2015, US Youth Soccer is collaborating once again with the Make Your Own Ball Day initiative this September and encourages colleges, leagues, clubs, teams and families to set time aside on Thursday, Sept. 21 to join National Make Your Own Ball Day. The mission of Make Your Own Ball Day is to use a ball to help kids create, connect, give, appreciate and play. MYOBD promotes and supports the passions of kids for sport and uses soccer as a platform for change. Throughout the month, in addition to promoting the benefits of being active through youth soccer, several chances to win soccer-related prizes will be available on the Youth Soccer Month website as well as social media. People will have the chance to win a soccer ball every day in the annual Ball-A-Day Giveaway or a sports bag full of US Youth Soccer items in the weekly Bag Bundle Contest. Make sure you check out the Youth Soccer Month Calendar as several State Association and college events are scheduled across the country, where spectators will receive Youth Soccer Month freebies as they cheer on their team. From ways to help grow the game to the fun giveaways to the different types of events taking place, follow the celebration online and show us how you’re getting involved using #YSM2017. Learn more at www.YouthSoccerMonth.org on how to get involved and share your ideas. Please contact JoEllen DeLeon at jdeleon@usyouthsoccer.org with questions or to get your event added to our calendar.